This is to try and give newer players a way to understand their role in the game. Due to the huge variety of vehicles and possible combinations there is no fixed role for any vehicle (other than artillery). Playing the same role even when circumstances change will get you killed. This system of role allocation is quite simple and quite effective and when followed it gives your team the best chance of victory. You’ll see various bits of advice that certain tanks are brawlers or snipers or flankers and so on but that’s not the whole story. Your tank might fill each of those roles by necessity in different games because your roles depends on your relative value to the team, not simply what you think your tank is good at. With this system the available vehicles are divided into 5 basic roles (I refer to both tank destroyers and tanks as “tanks”). These tanks are the main power of the team. They are going to be drawn from the top half of the team list and have the biggest guns and the thickest armor. It is their duty to seek out the enemy tank concentrations and engage them in whatever way is most advantageous, either offensively or defensively depending on conditions. These tanks should not be held back for base or artillery defense except in extreme circumstances as each vehicle represents so much combat power that it cannot be wasted in a passive role that will not see any action until the game is basically lost already. They all have to be up front and fighting as soon as possible. It is inadvisable for tanks from this group to use out of the way routes of advance as they can find themselves totally cut off from the fight and their team cut to pieces before they can be of use. Take the main routes and those positions that let you dominate as much of the field as possible. If they are not part of the battle then they are being wasted. Defend the base against more determined attacks. The Secondary line will often consist of the Tank Destroyer element of a team as they are not really suitable for fast moving flank attacks but have sufficient firepower (and sometimes armor) to be involved in the main battle. Tanks from this group can be held back from the battle for a short while if necessary while the threats develop so they can then move against them, they shouldn’t be used as the leading element of a tank group unless they are particularly suited for it with heavy frontal armor. If a stronger than usual base defense is required due to powerful enemy flanking groups the defense should come from this group of tanks, perhaps with one or at most two tanks from the main line if absolutely necessary. Flank guards act both as protection against enemy flank attacks by covering the likely routes or as attackers if there is no threat posed by the enemy along those lines. These will be faster tanks with generally lighter armor and guns than those of the Secondary Line. They are semi-expendible if they are able to achieve a worthwhile objective such as the destruction of a large artillery section in the enemy order of battle but should not be used up simply as suicide scouts with no real objective being achievable. Sending in 3 flankers to kill a single artillery piece would be a waste of resources for instance when they could be engaging other tanks on the field. This group should also see themselves as responsible for chasing down and killing enemy scouts that might break through so they should not be too far from their own artillery to start with. These are mostly expendible units who should be used to locate enemy artillery if it poses a major threat or to find the main strength of the enemy attack, should there be little or no artillery in the game. Their combat value is usually minimal so unusual tactics can prove to be of value on occasion. The big guns. The artillery should concentrate on the highest value targets they can; enemy artillery and tanks from the main battle line. Support whichever position seems to be the most critical at each stage of the game and not just where there are the most tanks, that may mean shifting fire from helping a successful advance at one point to helping a cracking defense on another part of the map and then back again as things settle down. There is really very little in the way of a fixed method of figuring out which group you should be part of. Players will have their own opinions on exactly where a particular vehicle fits into this system and that will not effect it much at all. Minor variations are fine and you shouldn’t try to set any hard and fast rules about a certain tank having to play a certain role or the player is a n00b. Roles change with circumstances, it is flexability that counts. The problems only start when a substantial number of players all deviate from this basic pattern and leave some roles unfilled. 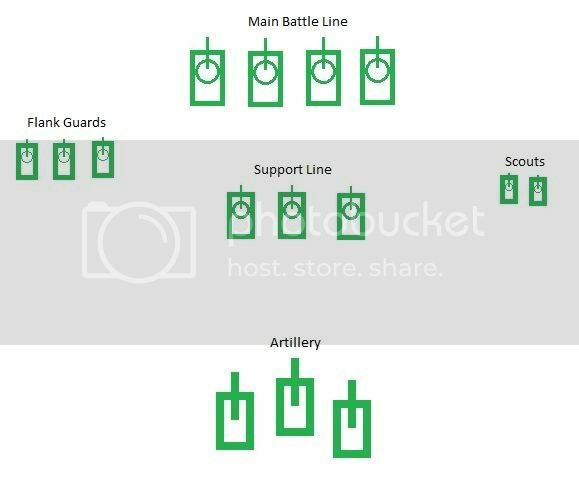 For instance, should the entire Secondary Line remain on base defense when it is obvious that the enemy Secondary Line has committed to battle already then you’ll see problems as your own front line is overwhelmed by weight of numbers. Or you might see a number of tanks from the Main Battle Line get involved in chasing after a single enemy flanker, abandoning their forward role and letting their lighter team mates be destroyed. The key to working within this system is that everyone must have a basic idea of what roles they may be required to fill and to take them on as it becomes obvious they must do so. Maybe you think you belong in the Secondary Line supporting the main battle but then you notice the tanks who really should be flank protection are already engaged up front. Well then, guess who just became flank protection? It is often up to you to fill the gaps in the most appropriate way but only if you can be spared from your real role. Sometimes things just go to hell and you can’t fix it. Most games are resolved as a matter of routine engagements in the expected places with the expected tanks, comparatively few are won with an unexpected and brilliant maneuver. The maps do not lend themselves to a lot of fancy tricks, just do what you’re expected to do and if you do it right, you’ll win more often than you lose. Here is a sample of how to divide a teams responsibilities effectively. As you can see, it’s not just a matter of taking the top 5 tanks and saying they are the main line, the next 5 are the Secondary and so on, it’s not so easy as that. The tanks that form the main line are those with the best gun/armor combination for head on combat. The L/70 on the Panzer IV and StuG III for instance is better than the L/48 on the Panzer III/IV, thus they are more suited to engaging enemy heavies. The speed of the III/IV makes them more suited to a flexible support role than to static position slugging matches. Each to their own. Sometimes the selection of vehicles you have will mean none are suitable for certain roles and that’s fine, there is no fixed “proper” number for any group. The groups are made up based on the tanks available rather than forcing inappropriate tanks into roles they are likely to fail at. Even with this sample I could come up with 3 or 4 equally good variations for grouping them, there is no perfect solution, just a general concept. Finally, a quick hint on what to do if you find yourself facing a strong enemy force that you cannot possibly beat, even if it’s just one much bigger tank. I see a lot of players, probably the majority die because they stand their ground and are destroyed in turn rather than reteating back to help where together with other team mates, they might win the fight. Nearly everyone leaves the retreat too late, once they are already being hit or are surrounded. The time to move out of a position is not once the shooting starts. If the enemy is already firing or in firing position, you’re dead. When you think you might have to retreat the time to do it is at the earliest possible moment, long before you are in actual danger and certainly before you are under fire. And you keep retreating back into your own defenses until you have enough friendly tanks around you to stop whatever is coming. If you see a powerful force coming towards you but then they disappear, that doesn’t mean you hang around to make sure they are still coming. They are deffinately coming. You should leave the instant you see them in the distance and not wait until they see you too. In this example, the forward tank retreats to join another just behind it. However even together they are not strong enough so both retreat to the next position and then all three retreat to where they have support from the main battle line. Only then should they look to put up a fight and stop the enemy advance at that point. If each green tank had stayed in position, the forward 3 would all be killed and do little or no damage to the enemy. Yet by retreating they eventually form a powerful gunline that can withstand an attack that individually, they cannot. This one aspect, the understanding of when and how to retreat properly will do more to keep you alive and win games than any other I could think of. Great skills are no use when you’re dead.